Selection of candidates will be made on the basis of Written Test and Carrier Marking. General/UR/OBC candidates have to pay Rs. 300 through SBI Bank Challan. SC/ST(Odisha Domicile)/PWD candidates don’t have to pay any fee. 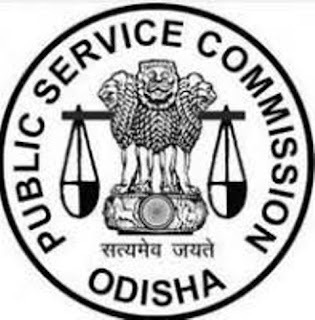 Interested and eligible candidates may apply online through OPSC website - http://www.opsc.gov.in/ - from 19-12-2017 to 17-01-2018 OR by sending the application form along with the photocopies of relevant documents to The Secretary, Odisha Public Service Commission, 19, Dr. P. K. Parija Road Buxi Bazar, Cuttack-753001 from 19-12-2018 to 29-01-2018. OPSC Recruitment 2017-18 - Job Location: Odisha. Educational Qualification : Candidates should have passed Bachelor’s Degree in any stream from a recognised university. (as on 01-01-2017) Minimum 21 years and Maximum 32 years. General/UR/OBC candidates have to pay Rs. 300 through SBI Bank Challan. SC/ST/PWD candidates don’t have to pay any fee. Interested and eligible candidates may apply online through OPSC website - http://www.opsc.gov.in/ - from 30-11-2017 to 14-12-2017 and candidates may also send their application form along with photocopies of relevant documents to The Secretary, Odisha Public Service Commission, 19, Dr. P.K. Parija Road Buxi Bazar, Cuttack-753001 from 30-11-2017 to 16-12-2017.